Last Friday, after many months of waiting, my Lytro camera showed up. I ordered one the day they were announced. I don’t shoot a lot of digital photos; I use my iPhone for Instagram, but other than that, I stick to film. I have a couple of Polaroid SX70s that I use a lot, and a couple of Polaroid Land 250s as well, including one that belonged to my father. I used to shoot with a lot of toy cameras like original Dianas and an Agfa Clack (among others), but shoot more with old Soviet cameras like my 1954 Kiev II and my Kiev 88cm (a.k.a. Hasselbladski). I’m not a professional photographer or anything, just an avid hobbyist. But the opportunity to experiment with an entirely new approach to photography was too great to pass up. 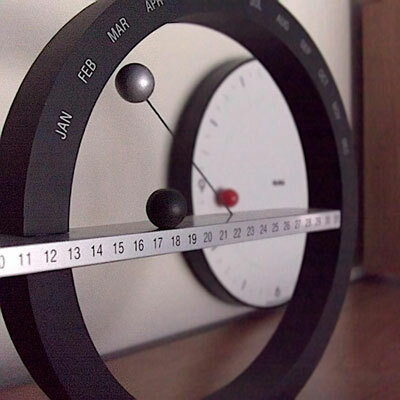 So, credit card burning a hole in my pocket, I ordered. And waited. 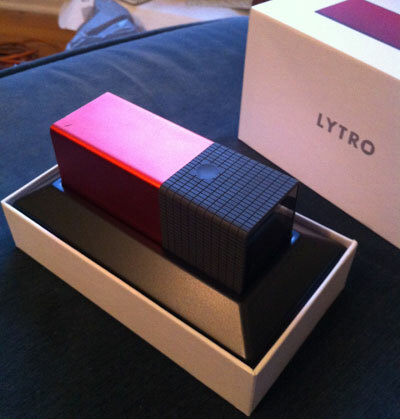 I actually did get my hands on a Lytro briefly back in December, though. I was walking through Bryant Park at lunch time around the corner from my office and stumbled across someone using a Lytro. I asked her if it was one, and of course it was. Turned out she was a project manager for Lytro. She let me take a few pictures with it, but since we didn’t have a computer handy, I didn’t get to see how they turned out. Still, it whet my appetite. The packaging was attractive, once I got it out of the ugly cardboard box and removed the padding it was shipped with. I love how so many companies are taking notes from how Apple packages their products. With the Lytro, you open the box and the camera is just there, as if on a stage custom made for it. They clearly thought about the unboxing experience. Right below the camera in the box was a small piece of paper, folded over several times. This is the quick start guide. There isn’t a manual; what serves as a manual is a few posts on Lytro’s support site. No matter, there’s not much to the camera’s interface. On the bottom, there’s a power button and a USB connector, and on the top there’s the shutter release and a very subtlely placed zoom control. That’s pretty much it. Now, I’m used to shooting with toy cameras, so I have no problem with a simple interface like this. But for gearheads, there’s a bit more to the interface; the LCD is a touch screen. Lytro pushes the idea of “living pictures”, photographs that you can refocus dramatically as a form of storytelling. It’s an interesting concept not typically seen in still photography. I used to rack focus as a way of shifting perception a lot when I worked in television as a cameraman in college, so it’s not something completely foreign to me, but it’s very different from the way most photographs work. The technology behind the Lytro doesn’t dictate that this is the only way you can use light field photography, but that’s what their software supports at the moment. It’s kind of a one-trick pony right now. You need to compose your shots in a way that not everything is in the same focal plane, that is, something is close to the lens and something else is far away from the lens. Ideally, one of these somethings sheds light on the other of these somethings in a way that tells a story, or increases your understanding of the first something. If you’re not constructing your photos in this manner, then the photos can seem like little more than a gimmick. There’s nothing inherent in the technology that causes this to be the case. One feature that’s missing from Lytro’s current software that they promise will come in a later release is the ability to focus everything in a scene. This changes the way you would use the camera dramatically. One feature of the camera is that the lens is at a constant f/2.0 aperture. That’s quite wide open, and in traditional cameras features a narrow depth of field. You can see this in the current software’s “living pictures”. That was a design choice Lytro made to make the living pictures more dramatic. But when the ability to focus everything becomes available, that use of f/2.0 for the lens means that you can use the camera in relatively low light and still capture an entire scene in focus. To do the equivalent with a traditional cameras would require stopping down the lens dramatically and using a concomitantly longer shutter speed. And one nice thing about that use case of the camera is that because you can focus everything in the scene later, you don’t have to worry about focusing it as you take the shot. Because of the way the camera works, there’s no auto-focus, and with that, no delay as the camera seeks the ideal focus. It’s just not necessary with the Lytro, and once the software is updated to enable wider depth of field, the camera will become more useful, not just for the limited case of the “living pictures”. One thing I’ve seen some users ask for is the ability to more finely define depth-of-field. Without that, you’re getting a camera that effectively shoots at f/2.0 or f/32 and nothing in between. I hope Lytro takes these requests to heart. One other possibility light field photography opens up is 3D photography. All the information needed to create a 3D rendition of your scenes is already contained in the files; it’s just a matter of Lytro programming their software to create it. They’ve promised to release this capacity sometime this year. Something that would be possible, but that I haven’t seen Lytro promise, would be the ability to shift the focal plane, that is, turn the camera into a tilt-shift camera. This is a popular effect that causes your brain to interpret the photograph as a photo of miniatures of whatever it is you’re shooting. Most tilt-shift photographs on the web today are artificially generated, particularly because tilt-shift lenses can be wicked expensive. I’ve played with the effect a little by using one or another of the lenses from my Kiev 88cm with an adapter made by ARAX so that it fits on my Canon cameras. I’ve never quite gotten the hang of it, but I still try once in a while. If Lytro were to see fit to include this in their camera, it would provide another use case, one that can be pretty gimmicky in itself, but really no more so than the current “living picture” approach. I hope they do this, if not in the next release, then in one not long after the next release. So does the camera work well? So long as you’re willing to work in the boundaries set by the “living picture” concept, yes, I think it does. It’s limiting, but no more so than using a Diana or Holga. Yes, it’s a lot more expensive than either of those cameras, but the Lytro has the promise of becoming more. I’ve shot just over a hundred photos with the camera since I got it on Friday. If you don’t take care to shoot within the constraints of the close/far rule, you get some pretty pedestrian looking shots. It can do some cool things, but right now, those cool things are all it can do. I haven’t talked much about the act of actually shooting with the camera, though. The form factor of the camera is unusual, even unique. I’ve seen it described as looking like a boxy telescope. It’s definitely interesting. The shape is defined by what’s inside. The exterior is divided into two parts, one anodized aluminum (blue, graphite, or red, depending on which model you order), and one rubber. The metal section contains the lens, which is a zoom lens that covers the 35mm equivalent of 35mm to 280mm, all at f/2.0. At roughly the point where the metal meets the rubber is the light sensor, about which more later. Behind that is the board containing the electronics for the USB port, a lithium-ion battery, the main circuit board, and the LCD. The size of the LCD is defined by the size of the lens, and that’s unfortunate. It’s tiny. A more traditional form factor might have allowed for an LCD that did a better job of displaying what the camera is seeing, and for a larger interface. The touch interface of the LCD is clever; you can swipe up to get access to settings, including a switch to “creative” mode that allows you to focus right up to the lens instead of the 4-6 inches that “everyday” mode gives you (at the cost of some distant focus). In everyday mode, if you tap on something in the LCD before you take the picture, the camera changes the shutter speed to more accurately expose for that item. In creative mode, if you tap on something in the LCD before you take that picture, that’s where the median point for focus is set. You can tell which mode you’re in by looking at the LCD; if there’s a blue border around it, you’re in creative mode, otherwise you’re in everyday mode. The camera turns on very quickly using either the power button or the shutter release, and because you don’t have to worry about focusing, you can go from instinct to shot in about a second in everyday mode. Unfortunately, if you’re outside in bright sunlight, you also don’t have to worry about framing, because it’s unlikely you’ll see much on the LCD, particularly if the sun is behind you. The LCD washes out much too easily. And if you’re a little off center of the LCD, the image posterizes and goes negative, which also makes it difficult to frame properly. That’s a shame, because the form factor is one that lends itself to shooting in a lot of different ways. I can definitely see holding the camera at foot level, for example, but it’s impossible to frame a shot taken in this way. Better LCDs are available; it’s a shame that Lytro didn’t spec one for the camera. As someone accustomed to shooting with toy cameras, where the preview is at best a rough approximation of what your shot will look like, this is perhaps less of an issue for me than for others, but it’s definitely something to consider. Then there’s the elephant in the room: resolution. One reason Lytro positions the camera as being useful primarily for “living photos” is that you don’t print them; their natural habitat is on computers. The maximum resolution available is 1080 × 1080 pixels, or just over 1 megapixel. I don’t think you can even find a phone with resolution that low at this point. If you really want to print something, you might be okay at 5 × 5 inches, but you don’t want to go any higher than that. I exported a couple of photos as JPEGs; they weren’t anything I’d want to print. The camera really is optimized for online. That said, if you understand how the camera works, it makes sense that the resolution is so low. The camera uses a traditional sensor inside, and its dimensions are 3280 × 3280 pixels, or about 10-11 megapixels (this is almost certainly the source of Lytro’s claim that they capture 11 megarays of information). In front of that sensor is a matrix of microlenses, each covering approximately 10 pixels square of the sensor to record the information the light field photograph requires. The information in each of those 10 × 10 squares goes up to make a single light field photograph. I can see the next generation of these cameras increasing the resolution to a more respectable 3 or 4 megapixels. Nokia just released a phone with a 41 megapixel sensor, and I’ve read of efforts to create 100 megapixel sensors for a reasonable price. For traditional photography, something like 100 megapixels is horrible overkill, but for light field photography? Could be just what the doctor ordered. But that’s about the next camera or the one after that, not about this camera. If you want to see exactly how the Lytro stores information, International Man of Mystery Nirav Patel has released some software to do some basic manipulation of the LFP format that Lytro uses. The photos are stored by default in a Mac OS X package in your Photos directory, which means that individual files aren’t supposed to be accessible, but if you right-click on the Lytro file in your Photos directory and select Show Package Contents from the resulting menu, you’ll be able to get at the raw files, which live in the images directory and have the naming convention IMG-xxxx.LFP. And since Lytro uses a pretty standard sensor, they are pretty standard raw files, which means that once you extract the raw files using Patel’s software, you can use other software to open the raw file and see what Lytro is doing. Basically, you’ll see the 10 × 10 squares I mentioned (or maybe more accurately, hexagons). The magic that converts this into a light field photograph is contained in Lytro’s desktop software. When you look in that directory, you’ll also see smaller files, with the naming convention IMG-xxxx-STK.LFP. These are the files that Lytro uploads to its servers rather than uploading the entire 16 MB full light field photograph. The file extension indicates that it’s the same format as the full photo, but that’s actually a bit of legerdemain; the file is simply a container for a number of JPEG files. That’s what’s uploaded to Lytro’s site; a number of JPEG files, each of which contains a focus state. I’m not sure how many they do for each picture; the one I looked at had five JPEGs, which seemed enough to cover the entire photo. For desktop browsers, the online viewer is implemented with Flash, but for devices without Flash (*cough* iOS, *cough*), the JPEG files are used without Flash to provide an equivalent experience. It’s a clever approach. So is the camera worth getting? I’m not sending mine back. I like it, even with its shortcomings. You may feel differently, especially at this price point. It’s definitely a 1.0 product, and the limitations of the hardware indicate that there is a point beyond which the camera won’t go. No question that it will get better as Lytro releases software improvements, but in a couple of years, Lytro will be releasing cameras that blow this one away and are useful for a wider variety of purposes, even as a primary camera. If you get the camera, you’ll be a pioneer, and pioneers usually end up with arrows in their hats. But if you’re a pioneer, you get to have lots of fun exploring. Light field photography is a radical leap forward. It’s entirely possible that in ten years, all digital cameras will work this way, and the Lytro is your entry into that. It shouldn’t be your only camera, or even your primary camera. But it’s a trailblazer, and even if it doesn’t ultimately make it to the promised land, you can definitely see it from here. Now listening to: "Green Beer" from He's Drunk by Scrawl.